Disney has unveiled a new poster for Tim Burton's upcoming live-action Dumbo, set to hit theaters this March. The film is a remake of the beloved animated classic from 1941, and stars Eva Green, Colin Farrell, Michael Keaton, Alan Arkin, and Danny DeVito. The remake looks to be a wonderful reimagining filled with charm, color and plenty of that classic Disney heart. Disney released the new poster via their official Twitter page, along with the charming tagline: "The one. The only. #Dumbo." 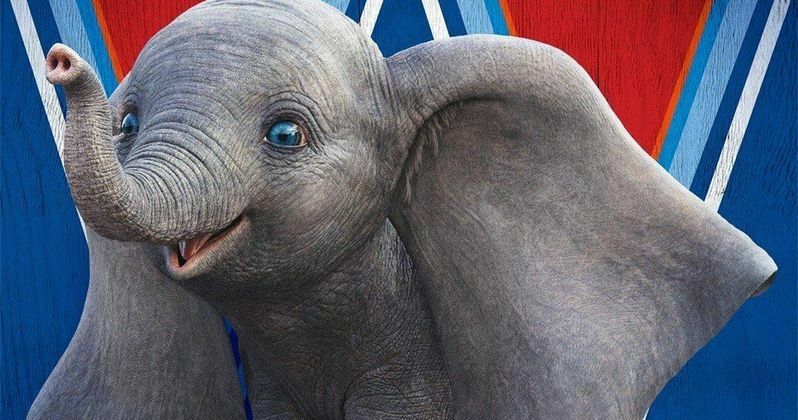 The film's new poster gives the cherished elephant the spotlight, showcasing his iconic floppy ears and adorable little face. Dumbo is Disney's latest live-action remake of their many classic tales, including Cinderella, The Jungle Book and Beauty and the Beast. Dumbo is thankfully following the basic concept of the original story, which follows an innocent elephant with floppy ears who has the ability to fly. However the cast of the remake recently revealed that Burton's take has a "completely new narrative," so there's no telling what they may have in store for us. This could come as a welcome change of pace seeing that most of Disney's recent remakes have stayed pretty close the original source material, and not always for the better. Tim Burton is definitely swimming in familiar seas with Dumbo, with his 2010 live-action remake of Alice in Wonderland still ringing in audiences' floppy ears. The remake grossed more than $1 billion dollars worldwide, and so the acclaimed director will hopefully see similar success with Dumbo. Helping him out is the massive successes of the other aforementioned Disney remakes, such as Cinderella grossing over $500 million, The Jungle Book with more than $900 million, and Beauty and the Beast with $1.2 billion. So there should be at least some confidence that Dumbo will share the commercial success of its predecessors. But even with that said, there's still probably going to be doubt with diehard fans if the remake will be able to come even close to the high-bar set by the original. It may be a touchy subject for fans, but the director's iconic style has been starting to come and go as of late. While the adorable black-and-white animated Frankenweenie struck true with critics and audiences alike back in 2012, other recent projects like 2013's Dark Shadows and 2016's Miss Peregrine's Home for Peculiar Children didn't fair as well. This is not to say that Burton has completely lost his touch, but hopefully Dumbo will be a return to form for him. Despite Hollywood's over-saturation of remakes these days, Dumbo definitely has potential to be a hit. The film is retelling one of the most beloved stories in all of the Disney cannon, and of course has a very talented team to back it up. So let's hope the passion and charm of this latest poster is just a sliver of what's awaiting us. Dumbo flies into theaters on March 29th, 2019. This news comes from Walt Disney Pictures.